Dissatisfaction with the colour saturation of even the most expensive oil or acrylic paint coupled with a resistless attraction to coloured images found in medieval illuminated manuscripts have prompted Wilma Tabacco to grind pure, unmixed pigments and make the paint used in many of the works in this exhibition. The powdery, or sometimes gritty, surface quality and colour intensity found in Nightshift, Dayshift, Gridlock, Updown,and Palettes are particular to her materials. 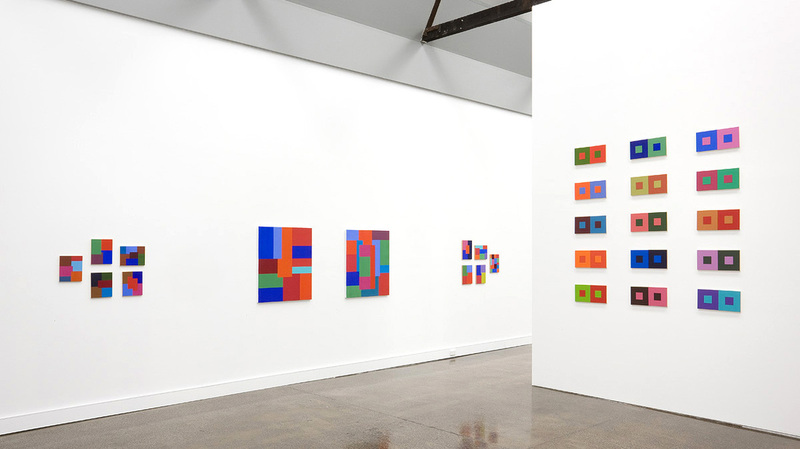 Her self-imposed restriction of using unmixed colour and simple abstract periodic structures has provided her with expanded scope for creating complex, spatially unstable but richly coloured works. In other works, for instance, Colour switch and Overunder, she reverts to commercially manufactured colour to produce a concentrated selection of the types of optical deceptions often seen in her abstract paintings.